Eunice enjoying a paddle on her river. HRWC’s longtime Board Member, Eunice L. Burns, peacefully passed away on October 20, 2016 at the age of 93. Eunice is the longest serving member of the HRWC board and the co-founder of Ann Arbor’s Huron River Day with her friend Shirley Axon. Eunice’s commitment to clean water and a healthy Huron River began with her service on the Ann Arbor City Council in 1962. She became involved with HRWC in the early 1970s and served as Chairwoman 3 times. 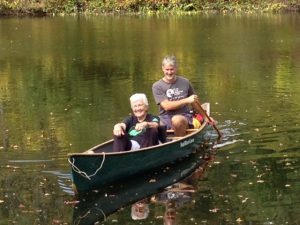 “Eunice cared deeply about the Huron River and the Watershed Council” said Laura Rubin, HRWC’s Executive Director, “She was always there to help out, stand up and let her opinion be known, and offer a big smile of encouragement”. Eunice was the embodiment of a good citizen. She never backed away from what she thought was right no matter the opposition and was courageous and dedicated in her actions. Her love for her community has stood as a shining example for her children, grandchildren, and those who knew her, of a vibrant, purposeful life rich in impact and meaning. Eunice liked to say that she had multiple careers, starting as a physical education teacher, and then entering political life in 1962 as a member of Ann Arbor City Council from the First Ward. She served three terms and went on to run for Mayor in 1965, the second woman in the city’s history to do so. In 1971, she began working for the University of Michigan as Executive Assistant to the Dean in the School of Education, and Chair of the Commission for Women. After ten years at the university, she became Manager of the historic Kerrytown Market, and in 1983, obtained her real estate license and worked as a realtor with Charles Reinhart Company until she was 85. Her family asks for donations in her memory to the Huron River Watershed Council or the Eunice Burns Fund for Water Policy Education in the University of Michigan Ford School of Public Policy.